“Livin’ on a Prayer” is Bon Jovi‘s second single from their Slippery When Wet album. The song is now considered a classic, a cornerstone of the long-running success of Bon Jovi, and is the band’s signature song. Jon Bon Jovi did not like the original recording of this song, which can be found as a hidden track on 100,000,000 Bon Jovi Fans Can’t Be Wrong. Richie Sambora convinced him the song was good, and they reworked it and included it on their Slippery When Wet album. It spent four weeks at number one on the Billboard Hot 100 in 1987, from February 14 – March 7 . It also hit number four on the UK singles chart. When Bon Jovi play the song in concert, they frequently end it with the guitar riff from Derek and the Dominos’ version of “Little Wing”. After the attacks of September 11th, 2001 — in which New Jersey was the second-hardest hit state after New York, suffering hundreds of casualties among both WTC workers and first responders — the band performed an acoustic version of this song for The Concert for New York City. Bon Jovi performed a similar version as part of the special America: A Tribute to Heroes. 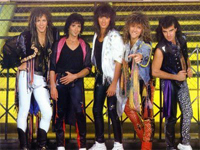 In 2006, online voters rated “Livin’ On A Prayer” #1 on VH1′s list of “The 100 Greatest Songs of the ’80s”. More recently, in New Zealand, “Livin’ On A Prayer” was #1 on the C4 music channel show’s “U Choose 40″, on the 80′s Icons list. It was also #1 on the “Sing-a-long Classics List”. On January 28, 2008, Livin’ on a Prayer re-entered the official New Zealand RIANZ singles chart at number 24, over twenty years after it was first released. Australian music TV channel MAX placed this song at #18 on their 2008 countdown ‘Rock Songs: Top 100′. The song is about a fictional working class couple, Tommy and Gina, who struggle to make ends meet and maintain their relationship. This is the first time that Sambora used the talk box as a lead instrument. Tommy “used to work on the docks” but the “union’s been on strike, he’s down on his luck”. Gina works at a diner, “‘workin’ for her man”. Some have interpreted the lyrics to be anti-labor-union, as the striking labor union seems to be the catalyst for the troubled chain of events for Tommy and Gina. However, others have pointed out that the song does not clarify the circumstances behind the strike, and that the rest of the song does not appear to have a political message. The video for the song featured shots of the band rehearsing, then playing in front of a crowd. The first half of the video when the band is rehearsing is black and white, and the second half of the video, onstage, is in color. In the beginning of the video, Jon Bon Jovi has a harness attached, and later in the music video he “soars” over the crowd by overhead wires. The music video was recorded at the Olympic Auditorium in Los Angeles, California. Bon Jovi made several references to lyrics in “Livin’ on a Prayer” in subsequent songs. * In the 1992 song “Fear” from Keep the Faith, Jon Bon Jovi sings “take my hand, I know we’ll make it”, similar to the line from “Livin’ on a Prayer”, “take my hand, we’ll make it, I swear.” The two songs share similar themes. * In the 2000 hit single “It’s My Life” from Crush is the line “this is for the ones who stood their ground, for Tommy and Gina, who never backed down”, again referring to the fictional characters. Additionally, in the music video, it is revealed the lead male character is named “Tommy” when his mother calls on him to take out the trash. Some other bands referenced Tommy and Gina in their songs, too. * Bowling for Soup’s Punk Rock 101 includes the lyric “Like Tommy and Gina/They’re livin’ on a prayer”. Bon Jovi have themselves reworked the song several times, including an acoustic live version that served as a precursor to the MTV Unplugged series and a re-recorded version of the song, “Prayer ’94″, which appeared on U.S. versions of their Cross Road hits collection. But the song has had a life of its own beyond the band, particularly in several dance music incarnations. Stellar Kart covered the song for their first album, All Gas. No Brake. The Audition recorded a version for Kerrang!’s CD Higher Voltage (June 07). Disco singer Hazell Dean, popular in the UK in the ’80s, recorded Hi-NRG/Trance remixes of the song, released on Academy Street Records in 1999. Jordan James recorded his own version, and released a slew of remixes of the song on the Robbins Entertainment label which charted on the U.S. Dance charts in 2004. Other dance versions of the song have been recorded by Topmodelz, Groove Coverage, and Heavydance. The song has been a popular karaoke and wedding band song and has been attempted by numerous contestants in the various worldwide Pop Idol competitions and similar talent contest shows. The song was sung by American Idol season 6 winner Jordin Sparks on May 1, 2007 as her pick for Bon Jovi week on the show. American Idol season 7 winner David Cook auditioned with the song. The song was sung also on Australian Idol, Season One, by runner-up Shannon Noll. It was considered one of his better performances. There’s even an oompah version in 3/4 time by UK oompah band Oompah Brass  featured on their 2008 album Oompocalypse Now . In 2008, Swedish rap group Looptroop made a cover on their album Good Things. They also made a remix called Praying On A Liver. Alvin and the Chipmunks made a cover version of this song on their 2008 album Alvin and the Chipmunks: Undeniable. New Jersey is the only state in the union without an official state anthem, but Bon Jovi‘s “Livin’ on a Prayer” is cited by many, after Bruce Springsteen’s Born To Run, as a sort of unofficial anthem. “Livin’ on a Prayer” was one of the theme songs for the 2004 presidential campaign of Democrat John Kerry. That same year, “Livin’ on a Prayer” was the “theme song” for the 2004 Boston Red Sox after their historic comeback in the American League Championship Series against the New York Yankees. During halftime at Philadelphia Soul Arena Football games, the song is played, paying tribute to their owner Jon Bon Jovi. For a commercial about the Arena Football League that Bon Jovi did with John Elway, he asks the quarterback who is suiting up to go into the fictional game. “What? Are you living in the past?” To which Elway says, “Better than living on a prayer.” The song is often played during Chicago White Sox home games, during an offensive rally when the Sox need a big clutch hit. The song has been performed by many college marching bands including at the University of Michigan, George Mason University, Auburn University, Purdue University, Notre Dame (Where it is also, as of 2008, a very popular song on campus), Michigan State University, Northern Illinois University, Boston College, Pennsylvania State University, Eastern Michigan University, and Columbia University and it is frequently a crowd favorite. The song’s chorus was used in an old Filipino Zesto orange juice commercial in the 1990s. The lyrics were reworked as “Cool and refreshing, that’s the way to go-o. Oh! Way to go, Zesto!”. Bon Jovi‘s “Livin’ on a Prayer” was featured in the film Charlie’s Angels: Full Throttle, and appears on its soundtrack album. A brief a cappella set of “Livin’ on a Prayer” was included as part of the November 7, 2007, episode of the TV show Gilmore Girls. It is a playable track for the music video game Rock Band 2. It is also a playable track for Guitar Hero World Tour. The song is in the 2008 version of the Cadbury’s “Trucks” advert. The song is also featured in the musical video game Karaoke Revolution Presents: American Idol Encore 2.